Efrain Diaz Figueroa, right, walks by his sister's home destroyed in the passing of Hurricane Maria, in San Juan, Puerto Rico, Monday, Oct. 9, 2017. 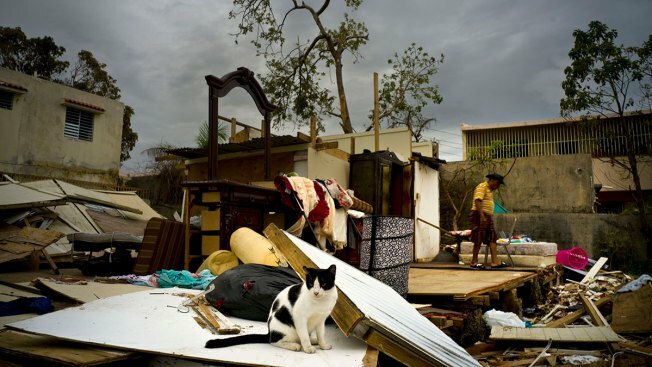 Maria sent tens of thousands of Puerto Ricans fleeing to the U.S. mainland to escape the immediate aftermath of the storm. The 70-year-old is waiting for a sister to come take him to stay with family in Boston. “I’m going to the U.S. I’ll live better there,” he said. Puerto Rico’s governor set a goal of reestablishing electric service to 30 percent of the island by the end of the month after Hurricane Maria devastated the U.S. territory's infrastructure, with the goal of connecting restoring 95 percent of service by Dec. 15.